Runner's Knee: A Common Knee Injury | Podiatry Associates, P.C. You can’t run without knees. You might be able to walk or shuffle around like a stiff creature from an old monster movie, but running requires the ability to bend. Your knee joints are crucial for your ability to rapidly push off the ground, swing your leg forward, and absorb hard impacts. When something happens to your knees, you feel it every step. Runner’s knee is a common overuse injury that can hold a runner back—but with the right care, you can return to your regular mileage and enjoy your next race. Runner’s knee is actually a simple name for a condition called patellofemoral pain syndrome (PFPS). It’s a problem with stress and irritation around or under your knee cap. Repetitive strain is the source of this overuse injury. Constant hard impacts and pressure from pushing off the ground can take its toll on your joints. Eventually the soft tissues protecting your knee cap and knee joint in general become irritated and inflamed. The condition can involve worn down or torn cartilage as well, and in some cases may include strained tendons. The condition has many causes and is influenced by many factors. Overuse from pushing your knees further or harder than they can handle is one of the most common problems, but issues from poor conditioning or bad running technique may overwork your joints as well. Strain from weak quads and hamstrings, or overly stiff muscles, could be a factor, too. Some people are prone to the condition because of their kneecap shape, injuries to the joint, or preexisting issues like arthritis. Like other overuse injuries, the condition will get worse if you don’t take care of it properly and right away. It will not improve on its own. Our physical therapy experts, like Dr. Jennifer Molner, DPT, will examine your knee to diagnose the condition and determine what factors may have caused it. From there, we work with you to establish a plan to treat and eliminate the pain. Typically this will mean dramatically scaling back, or even taking a break from, your running. Since running is the source of the stress, continuing without changes will only make the problem worse. Instead, low-impact activities and cross-training will help you keep in shape. Icing and wrapping your joint may alleviate inflammation. Once it’s safe to do so, you’ll begin physical therapy to strengthen your knee and help it function more efficiently without getting overworked. Therapy may include muscle strengthening to stabilize your joint, and stretches to relax tightened tissues. This can also help you ease back into conditioning when you’re able to start running again. You’ll need to take steps to prevent the injury from recurring in the future, too. Make sure you wear appropriately supportive footwear to prevent stress from overpronation. 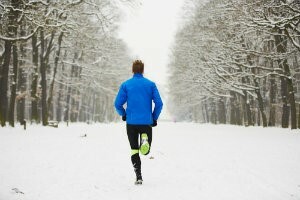 If you struggle with your running technique, you may need proper training to make changes. Stretch regularly and always warm up before a run. If you plan to increase your mileage or speed, make the change slowly so your knees are able to adjust. If you experience any knee pain, cut back on your running immediately. Healthy joint are important for a runner at any level, whether you’re just getting started or you run marathons. Runner’s knee can start small, but if you allow it to continue, you’ll end up with a lot of pain and be forced to slow down. Don’t wait for that to happen. Stay on your feet and on the go by taking care of your knee joints. Our experts at Castle Pines Physical Therapy and Cherry Creek Physical Therapy can help you keep your lower limbs and joints running at their best. Contact our Castle Pines or Cherry Creek in Denver, CO offices online or by calling (303) 805-5156 to make an appointment with us.